There have been several articles written about the strength of integrating social sharing into the purchasing process. I remember hearing about a case study where Nike encouraged users to share a link on Facebook that highlighted merchandise they had just ordered. Nike gave online shoppers the easiest possible option to show off their purchase to their friends. Earlier this year, event-planning site Eventbrite wrote a blog post showing that their users were only 40% likely to share information about an upcoming concert/event on Facebook before buying tickets, but that number jumped to 60% if presented with that same option on the order confirmation page. Drilling even deeper into Eventbrite’s numbers, we learned that a post-purchase share on Facebook drives 20% more ticket sales per share than a pre-purchase share. We had an inkling that these convincing numbers would have a similar affect with online users choosing to share their hotel booking on Facebook. We worked with a third party vendor (whose name will remain concealed) to include a social sharing step on the final stage of the online booking process. The below screenshot illustrates the path an online guest would take in discovering the social sharing messaging. 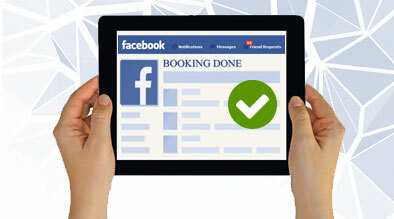 About 30% of guests booking online decided to post the message to one of their social channels. Each social message posted by a guest drove an average of 5 to 6 unique visitors to the hotel website. Overall, the test seems to be a success. Allowing users to easily share a purchase story on their social channels can be very effective in gaining more traffic and potential customers. People trust their friends, especially when it comes to making a purchase decision.